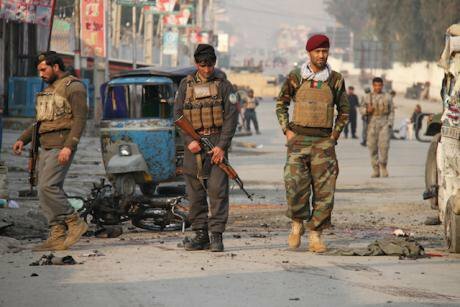 Afghan security force inspects the site of a suicide bomb in Jalalabad, Afghanistan, 03 December 2017. NurPhoto/ Press Association. All rights reserved. Afghanistan is at a crossroads facing two possible futures: indefinite violent conflict, or gradual progress towards sustainable peace. Choices made now over strategy, tactics and resources can tip the balance either way. The recent declaration of a temporary ceasefire by both the Afghan Government, and, for the first time since they were ousted from power in 2001, the Taliban, could be a first step on an incremental journey towards peace. But what should happen next and how can this gradual progress towards peace be supported? Accord’s latest publication on peace in Afghanistan, produced by Conciliation Resources, highlights the need for a radical new approach to peace in the country – one that builds progressive steps towards de-escalation and reconciliation and includes Afghan society as a whole. Uniquely, the publication brings together in one place perspectives on peace from both the Government of Afghanistan and the Taliban – with contributions from the Chair of the High Peace Council, HE Mohammed Kareem Khalili, the Taliban Political Office in Qatar and senior representatives of five Taliban factions. Across the 25 chapters, contributors also span a range of outlooks and insights of Afghan and international men and women from academia, the military, politics and civil society. Accord’s editors argue that the process towards peace must begin with measures to reduce violence as a basis to build confidence in more fundamental change over time. Lack of confidence among the warring parties is the primary blockage to progress towards agreement on even the most basic issues. It is driven in the first instance by the pervasive violence affecting many parts of the country. Confidence is further compromised by widespread mistrust of formal negotiation processes and agreements, and perceptions that national institutions are corrupt and partisan, as well as by the dual system of governance in Afghanistan – with the government running the main population centres and the Taliban much of the countryside. President Ghani’s offer of peace talks in February provides a rare opportunity and a practical platform around which to coordinate international support for an Afghan-lead peace programme. The subsequent temporary ceasefire affords a more concrete opening for both sides to demonstrate their willingness and ability to deliver tangible progress. International support could add credibility, accountability and resources to President Ghani’s proposals. But measures to reduce violence must be tied to wider efforts to build peace. Evidence from the Political Settlements Research Programme, to which the Accord Afghanistan study belongs, shows that the success of peace agreements to resolve immediate violence has not been matched by longer-term commitments to broader reform, and that peace agreements have more often led to uncertain and often impermanent peace and political stalemate. Although the Taliban have announced that they would not be suspending offensive operations against foreign troops as part of their ceasefire, the US and NATO have agreed to support the government’s initiative. Building on this, a joint commitment by NATO and the Afghan government to reciprocate plausible future Taliban de-escalation measures could help convince the Taliban of the reliability and breadth of their commitment to reducing violence. It could also help joint planning for future measures such as conditional prisoner release, temporary de-listing of sanctioned Taliban and safe-conduct or security guarantees. In statements in the Accord publication, leaders from five different Taliban factions express an interest in achieving non-violent political status. At this stage, the establishment of locally agreed ‘peace zones’ could be supported while the terms of more permanent ceasefires could be renegotiated and the zone potentially expanded, supporting de-escalation from the ground up. Incentives to join could include providing protection for participating groups and leaders. Parallel progress towards reducing violence at a national level could help protect local initiatives from being ‘spoiled’ by the central leadership. Parallel progress towards reducing violence at a national level could help protect local initiatives from being ‘spoiled’ by the central leadership. Despite the very real challenges and uncertainty over the long-term implications of the temporary ceasefire, it still gives us grounds for optimism. The tangible decrease in violence that resulted can help to build momentum towards sustainable peace in Afghanistan. But the country still has a long way to go, and a step-by-step process towards a settlement offers a way to move beyond the peace rhetoric, building stability, confidence and legitimacy over time. To find out more visit www.c-r.org/afghanistan or www.politicalsettlements.org.